These are the best wings that I’ve ever had…hands down. When it comes to chicken wings, I consider myself world class judge of greatness. Two Dudesl Seafood gets two thumbs up for having the best wings in the state of Florida, and maybe the top ten in the U.S. I’m hanging with Rob, one of the two “dudes,” and am reminded why I love small business, locally owned joints that serve ice cold beer, amazing wings and from what Brian tells me, an amazing soft shell crab BLT with a side of spicy onion fries. 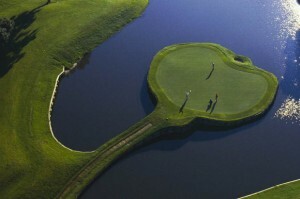 This is the Island Green at TPC Sawgrass...a legendary golf shot. This place sits in Atlantic Beach on the corner of Seminole and Atlantic Blvd, if you’re in the area and so inclined. An ex-Navy super guy, you can’t beat the dudes for fresh from the dock seafood any time of the day or night. The decor is early pier, the service personal and phenomenal, the food – great. Blackened Mahi, fresh Oysters….you get it. My inner foodie is in love. We’re gearing up to go to TPC Sawgrass, with early play on the driving range for my hubster then off to the “stadium course” that is so famous for the Players Club tourney. He didn’t qualify for his slot in the Open this year – bummer – but he’s happy to be playing the professional course for the first time. I, on the other hand, won’t be gracing the stadium course or attempting the island shot at 17 – I’ll leave that to the PGA guys that he’s going to hang with. Did have to promise that I wouldn’t “accidentally” fall in the water to collect any of the 250,000 missed shots that lay in the water around the island…even I’m excited about the course I’ve watched on the golf channel more often than not. I’m there for photography support and to look tan in my new golf outfit. 🙂 A girl has to have real priorities. I’ve amended my statement on the overall meaning of life being the journey. It’s not just the journey, but what you love and how you express that along the way. The past few days of togetherness with my BFF and my intimate family reflects back to me how much I love the life that I lead…how much I appreciate the unique love and appreciation, the differences in each of the people in my life. It’s moments like these, in the spaces of unique time when I look across at Brian or Taryn playing in the sand, or the amazing smile of my daughter as she plunges her boogie board in the coming wave with a squeal of pure joy for hours on end…it’s here that I’m reminded of that journey and how much each day really counts. I came with a child that had never seen the ocean, watched her heart change in the instant that she took it in. I am leaving with someone slightly older, more in tune with her emerging self. She’s still my seven year old daughter – but she’s different now. When I think of a vacation as just a few days in time when we didn’t go to work, it somehow makes it worth so much less than what it is. This is nine blissful days of being in tune with the people I love the most in the world, their needs resonating with my own, undisturbed by nearly any technology. And on that note, I’ll bid you adieu until next time. I have a wave calling my name.